Buttercups & Daisies Florist Birmingham | Same Day Flowers before 3pm. we offer same day flower delivery on all orders before 3pm in Birmingham. If you are looking to send flower in Birmingham or further afield – look no further order here and let award winning Buttercups & Daisies Flowers Birmingham take the hassle out of sending flowers. You can ring and pay by phone or order online from our website here. We accept Mastercard/Visa/Paypal . We are an independent award winning local florist offering a wide selection of floral items from bouquets to arrangements and will try our best to tailor our floral items to any occasion. 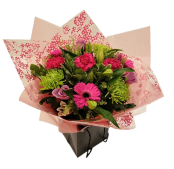 We can provide same day delivery on all orders placed before 3pm this includes national and International delivery through Direct2Florist. We offer a friendly and welcoming experience to each customer and strive to achieve the very best service by meeting your every need down to even the minor details to ensure that you leave our shop 100% satisfied. We specialise in designer funeral flowers tributes Selecting a fitting funeral flowers tribute requires careful thought and consideration. This is where the advice and guidance of your local florist can prove invaluable. Our experienced florists will be able to talk you through the various different types of funeral flower arrangements and help you choose a profound and heartfelt tribute to the deceased. They are also likely to have a working relationship with your local funeral directors so will be able to liaise with them on your behalf to answer any questions you may have with regards to when and where the flowers need to be delivered. We also cater for Weddings Make your big day special with expertly selected wedding flowers. With so many shades, textures, styles and designs to choose from, you are sure to find the perfect flowers for your big day. Our dedicated team of expert wedding florists will help you bring your vision to life and will make sure to add those important personal touches for the bride and groom, bridesmaids and ushers, special guests and venue decorations. For fashion-conscious brides we have a unique, luxury range of designer flowers. Browse our vast collection of wedding flowers and help us make your big day special! Discover the latest trends in floristry and learn more on how to incorporate them in your dream wedding décor. For more inspiration and ideas contact us on 0121 476 6534 to book a FREE wedding consultation.